Mi-Teintes Pad A4 Warm Colours 15 sheets assorted Warm colours in an acid free vellum drawing paper- It is 160gsm & coloured in the pulp making the shades highly light resistant- It is ideal for pastels, pencil and crayon- It is also suitable for gouache,watercolour and acrylic. Mi-Teintes Pad A4 Pastel Colours 15 assorted pastel colours. 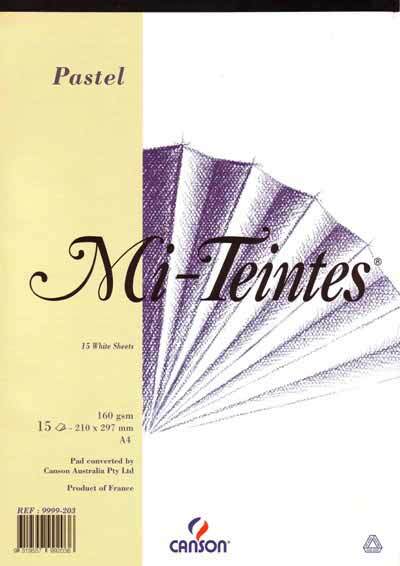 Mi-Teintes A4 Pastel Pads 160gsm White 15 sheets - ideal for sketching and artwork with pastels, pencils and crayons. It is also suitable for wet techniques - gouache, watercolour and acrylic.